Once you're up and running with your Honey account, we'd suggest taking a quick peek at your Honey account settings to ensure they're configured exactly as you'd like them. Here's how. Once on this page, you'll see a number of settings options listed on the lefthand side of the page. Let's walk through them. In the Profile section of your account settings, you can add and edit your name, job title, contact information, and profile details. Don't forget to click Update Profile at the bottom of the page! Managing your password & security. 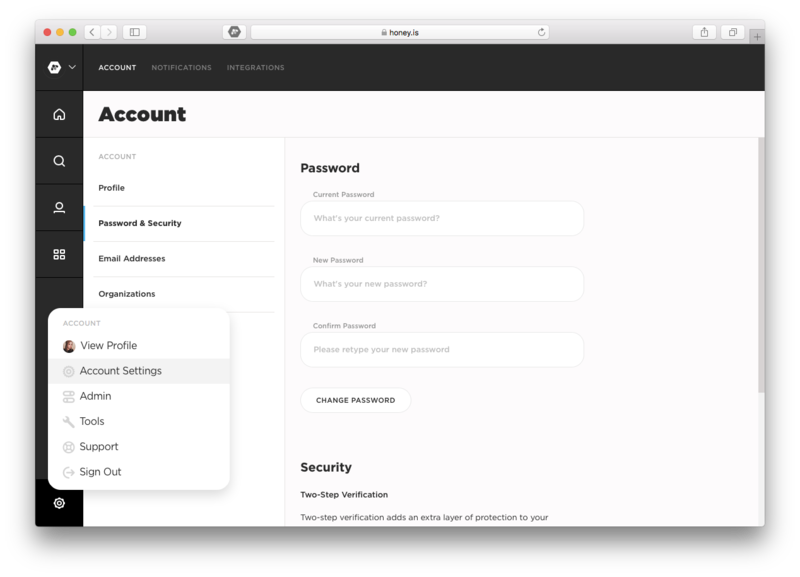 In the Password & Security section of your account settings, you can manage your password and two-step verification options. Enter your current password, new password, and new password confirmation in the Password section at the top of the page. Easy as that. Next time you sign in, use your new password to access your account. Click the Enable Two-Step Verification button. Follow the steps to set up two-step verification using a text message to your phone or app of your choice. If at any point you'd like to disable two-step verification, revisit this page and click the Disable Two-Step Verification button. By default, your Honey account has one primary email address—this is the email address that you use to sign into and Honey and the email address where you receive Honey notification emails. You can manage all of these options from the Email Addresses section of your account settings. Type your new email address in the Add New Email Address text entry field. Then, click the Send Verification button. Visit your email inbox to find the verification email and follow the steps to verify your new email address. Then, return to your Account Settings>Email Address page. You should see your new email address listed at the top of the page. Click the star icon next to your new email address, which will update it to Status: Primary. Easy as that. Once your new email address is marked as Primary, it is the email address you'll use to sign in to your account. You can also add secondary email addresses which are used solely for emailing posts into Honey. This means that when a secondary email address is added to your account, you can send an email-in post from that address and Honey will recognize you as the sender and, accordingly, publish the post from your account. Once verified, you can email-in posts from this secondary email address.